ASA Today: Blizzard of Books! 200 New Books to Read! Thanks to the efforts of Jill Ott and her volunteers last year at the Scholastic Book Fair, we are able to provide what we are calling “A Blizzard of New Books.” There are 200 new books available for our students to check out, starting this week. Remind your children to return their books by library day, so they can explore our new finds. Also, please be generous in your volunteer time and your purchasing at this year’s upcoming Scholastic Book Fair. It’s making a wonderful difference. As you may have noticed, if you’ve popped into our library this school year, we are in the process of “weeding and refreshing” our collection and making it easier for students to put their hands on the right books for them. We keep trying to broaden their reading horizons. I had been the librarian at St Jude School for 18 years until I retired 10 years ago. I stepped back into ASA library this school year, for now, and I’m enjoying encouraging our young readers. Thank you to these volunteers who have been on board this year: Summer Malinzak, Christy Stibich, Barb Kramarz and Nora Barkey. We couldn’t do this without them! We are always open to additional volunteers. A couple of our volunteers are also retired and will be doing some travel this winter. Library times are Tuesday and Thursday mornings. Your help even for partial shifts or once a month is welcome. Sometimes it works to bring little ones along with you. 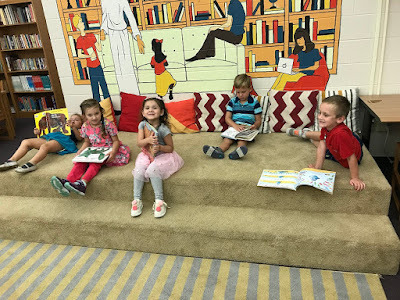 Maybe you’d like to come in and simply read a story to your child’s class at library. Remember, preschoolers are also coming to library on a rotating cycle. Please contact me through the school, if you are interested in joining our library team in any way.